I have worked in HT group around 25 years, which is the first job that I working until now. 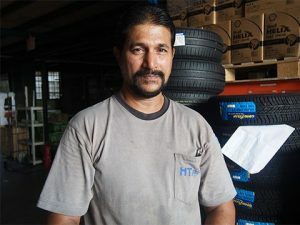 Currently, I am working as a storekeeper who takes charge of arrange the tyre and keep them in the right place as well as make sure they are neatly arranged. Before I worked as a storekeeper, I was worked at HT Truck Service and a driver around 4 years. For me, this is a good company that will provide employee freedom to do their work as long as you can do what you should do. Also, the working environment of the company is secure and safe and colleagues here are friendly. I joined HT Group on 1988 at the outlet of Hawk Tyre Service where located at Sri Tebrau. Over the years, I had worked at four places. When I joined HT group, I was worked at the outlet around 10 years and transferred to the warehouse at headquarter where I worked for 7 years. After that, I was transferred to purchasing department 7 years and changed to logistic department where I am working today. HT Group gives us opportunities to learn from the beginning and gain experience through working. At HT Group, you can learn many things as it has distributed different types of product (tyres, lubricants and batteries) which under different companies. I have worked at HT Group since it is managed by our late founder Mr. Tay See Cheong until now HT Group is pass to their 3rd generation to manage. 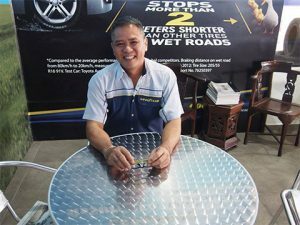 At the beginning, where I worked was only a small car tyre shop established in Jalan Ngee Heng. I saw HT group grow from a small car tyre shop until it has many franchises, several companies and warehouses. The late founder is fierce, but he hoped us to get better as well as helped us when we have difficulty. Currently, I am helping to load and unload goods. At HT Group, we work as a family, help each other and colleagues are friendly and nice. I have joined HT group around 7 years and I am responsible for managing the daily operation, sales and the outlet of HT Truck service to make sure everything goes smoothly. At that time, I would join HT group is through a friend who works at HT group. I am glad that I joined HT Group, a company that is an industry leader. My job is challenging and interesting as everyday I can meet different things and work for it. Also, our company has complete facility and the working environment is clean and tidy. I hope our company is getting bigger, the expansion and our management should be parallel in order to make sure our company can operate smoothly. Welcome everyone joins us to accept the challenge and let yourself grow. I have joined HT Group as an internship trainee in February until Jun 2017. Even though it just a short period, I am glad that I can joined HT Group since I have gained a lot of proficiency which absolutely difficult to find in other places. I am responsible for managing in MobilServ oil analysis which is one of the crucial services provided by this company and I also had the opportunity to join a site visit in Tanjung Bin, Pontian which is certainly a new experience for me. Besides, what really make me impressed to enjoy have an internship here is its surrounding. HT group has a very strong organization in which workers are united in developing the company and I am very lucky due to have a chance to learn and supervised under a very capable supervisor. Cheerful and friendly colleagues are also contributing to my happiness in having an internship here. Thank you HT Group for giving me this valuable opportunity. I have joined HT Group 31 years. 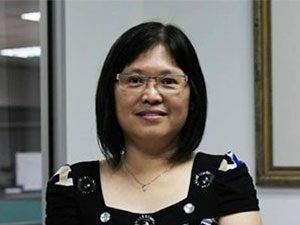 At first, I was a counter clerk working at different outlets work for 5 years and transferred to office located at Ngee Heng work as an office clerk for 5 years. After that, I had transferred to the headquarter where located at Tampoi when it is established as a administrative. At that time, I had learned from different boss who are our late founder Mr. Tay See Cheong, our Managing Director Mr. Tay Meng Yong and our Chairman Mr. Tay Ming Wah. I learned a lot from them as different boss had different method to manage business and they are willing to teach and share with us. Currently, i am worked as Operation Manager of Hawk Tyre Service Sdn Bhd. I have to manage 10 branches operation to make sure everything is going smoothly. What I can say for HT Group is that they treat employees nicely by providing good benefit for employees and our bosses are very friendly, willing to teach and sharing with us. I joined this company on July 2005 as an account assistant at HT Truck, then transfer to Hawk Tayar to in charge property and currently manage HR affairs, properties and administrative, which related to company corporate. Before I joined this company, I had 10 years working experience at hotel line, 10 years working experience at logistic department and 2 years at travel agency, so I have used my past working experience to work at here. However, when I transfer to HR department, I feel challenging as I didn’t have experience in HR affairs. Yet, I can learn something that I did not experience before from here. There is a lot of expansion and improvement compared to the time I joined this company. At that time, everything is doing manually, but now become very systematic, all using software and server. I think this is a good place for who just step into the workplace as a stepping stone, as long as they have the initiative to learn. I have worked around 20 years in this industry; I joined this company when I was 14 years old. Although I had out on my own career around 25 years old, at last I choose to join back this company as I enjoyed my work at here. Currently, I am responsible for business development to increase the sales of our outlet as well as develop new outlet and cultivate new employees for our outlet. As our company has passed to 3rd generation, has new management, so I have to improve myself in order to keep up with the new management. Luckily, our company is humanized management; there is no power distance between management and labor. Our bosses are trust on us and let us to work on our idea, that’s why I enjoy working at here.